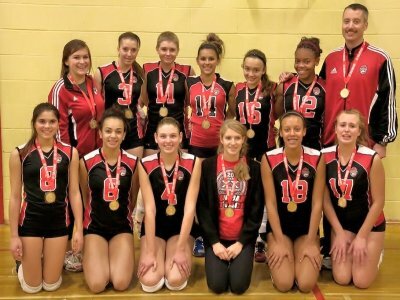 April 1st,2012 WATERLOO — The successful season of the Durham Attack U16 Black girls’ volleyball team continued into the provincial championships in Waterloo, where the team took home the silver medal. After winning the first two tournaments on November 19th and 26th, Durham Attack Black U16 continued the season at Championship/Premier Level with a few more excellent performances. On December 17th, in Kingston, after a long game in the Finals the team was upset by Storm Bolts 15U, winning Silver. It was a hard loss in tie-break. They were back in Kingston on January 14th, this time in U17 Championship East Division. Overall, it was a good weekend with the first 3 games finishing in tie-breakers (1 win and 2 losses). The last game won the team a 5th spot (25-13; 25-14 vs. Etobicoke Titans). On January 28th, in Cobourg, the team, for the first time, played in the U16 Premier Division. Coming in as the underdog they have started the day a little slow losing the first game to a powerful and focused team, Eclipse West. However, from the stands you could see Durham Attack’s game growing as the day got older. The team was very resilient and all those Sunday mornings in Team Twelve training would show in the semi-finals and finals. Oh, and what games they played…Durham Attack surpassed the ranked 1 team STVC in the semi and Eclipse West in Finals (again). This last game earned them the bragging rights: First in Province. On February 18th Durham Attack will defend this position in Keswick Tournament. 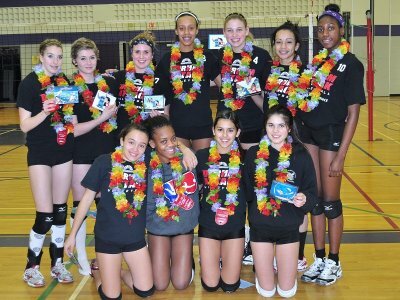 Last U17 tournament played, on February 4th, Peterborough saw Attack on the Podium again with a Bronze medal. Outside of the competition courts, Durham Attack Black U16 prepares ambitiously 5 days a week. When they are not on the court or in the gym, the coaching staff helps the young minds getting stronger. Along with applied sport psychology techniques, various team building events are important in team development. 3 coaches, 12 players and many parents is the right recipe for success. 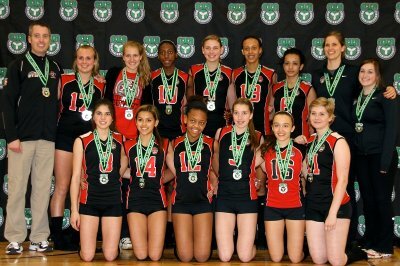 For Durham Attack Black U16, volleyball is not only the sport of preference; it is a way of life. Not wasting any time, the team followed their win in Keswick by competing in an age division higher the following week in Barrie, Ontario. A slow start saw Attack losing to the host Barrie Elites in their first match of the day (17-25 ; 23-25), followed by a clear win against U17- Stingrays (25-16 ; 25-18). Despite the loss in the first match, we finished first in the pool. Quarter finals: a deserved win against U17 – Toronto West (25-17 ; 27-25) moved us to the semi’s where a dominant Durham Attack team won the match against a good U17 team – Etobikoke Titans Black (25-21 ; 25-21). This is where we knew something good was about to happen… The Finals: U17 Eclipse West (former Etobikoke Titans – a well decorated team last season) was the opposing competitor. We could write long lines about this game…instead let’s just say the score one more time… 25-12 ; 25-19. Watching the game (and re-watching the videos) one can only say: That’s Entertainment!!! Remember what we’ve said at the beginning of the article? 11 players, six different teams – only this time it was just the case of 11 players playing as one, shutting down another powerful team. Thanks to the coaching staff, Evan Williams, KellyVerboom and Lauren van Quickenbourne this team it’s on its way to great volleyball moments. Now, we only have time for one more thing: Jayden Duquesne-Kennedy, Renee Atkinson, Mollie Gearin, Jazmin Shannon, Sarah Remedios, Sydney Schurman, Megan Romain, Kiana de la Cruz, Soranne Floarea, Jessie Hilton, Dana Marlatt. Congratulations! Play hard, have fun and win some more!